Here you will find all of your Concrete Etching Solutions & Mastic Removers needs. We carry multiple/all types of concrete cleaners and mastic removers. If you can't find something that you're looking for, please give us a call at 1-800-227-8479. • SAFE in occupied areas! Made with soy and is definitely the safest and best remover on the market. Just spread on the mastic to be removed, and then wait 10 minutes, and scrape the mastic off! To make sure all the residue is off before mastic re-application sprinkle water, and if the surface turns white, the mastic residue isn't gone. Just simply keep adding water, and wiping surface until residue is gone! 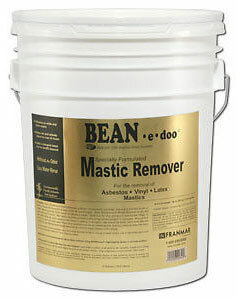 BEAN-e-doo Mastic Remover is not recommended for wood surfaces. For optimized performance, dillute the etch 'n clean in a 1 to 1 mix ratio with water. (1 gallon of etch 'n clean with 1 gallon of water). This will give you 2 gallons of solution to work with. (500+ sq/ft feet). If the concrete has been steel-trowelled, the surface will be very smooth. This finishing technique works fine cement particles to the surface creating a very hard, dense finish. Steel-trowelled floors may require multiple applications to achieve the desired profile. 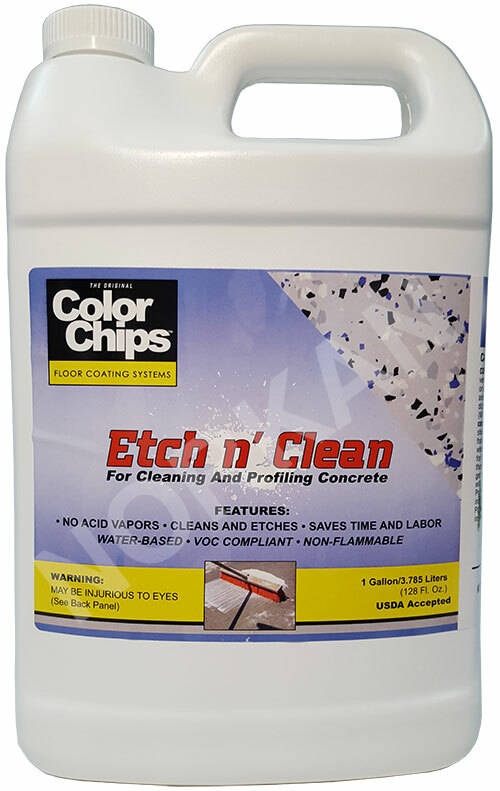 The Original Color Chips Etch 'N Clean Has several uses! Cleaning, degreasing and profiling the surface to prepare it for coating, staining or sealing. Cleans, degreases, derusts and creates a phosphate conversion coating. On concrete, Etch 'N Clean reduces preparation time by eliminating the separate pre-cleaning and rinsing operation before acid etching. On Passivated Galvanized, Etch 'N Clean degrades the passivation coating on galvinized steel and impoves coating adhesion. On steel, Etch 'N Clean cleans, degreases and provides a phosphate conversion coating for improved corrosion resistance and enhanced coating adhesion. Etch 'N Clean has no acidic vapors eliminating the accidental corrosion of ductwork, electrical contacts in machinery and equipment and other sensitive parts. Additionally, Etch 'N Clean is ideal for use in areas with limited ventilation such as basements, swimming pools, containment areas and pits. Etch 'N Clean is odorless, non-flammable and is safe to use near vegetation. 1) Dillute 1 gallon of water to 1 gallon of solution. 2) If available, hot water will accelerate cleaning and etching. 3) Sweep loose debris and dampen the surface with water. 5) Triple rinse with water to neutralize. On floors, squeegee off rinse water to speed drying. 6) Allow the surface to dry thoroughly (minimum 24 hrs). Floor should resemble 100 grit sandpaper or more coarse. If not, etch again. The Original Color Chips Floorshine is the ultimate floor finish. A 25% solids, metal crosslinked, polymer finish will make your floors look wet even when they are dry. Apply a thin uniform coat of finish to floor with new rayon mop. Allow to dry approximately 30 minutes. We recommend applying 3-4 uniform coats in this manner. Never pour left over finish back into the container to avoid contamination.